Following a tradition that began in 1973, Petit Lafitte, formerly Capitán Lafitte, is a small, charming, beachfront hotel. Our property is surrounded by palm trees and beautiful gardens and faces an uncrowded white sand beach on the dreamlike Caribbean Sea. 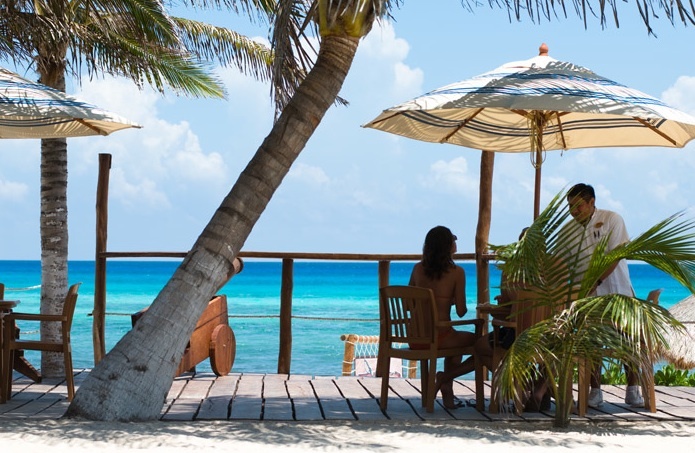 In an expanding world of super-sized resorts, we are proudly redefining luxury through personalized attention and excellent meals all served in an inviting and non-pretentious atmosphere. 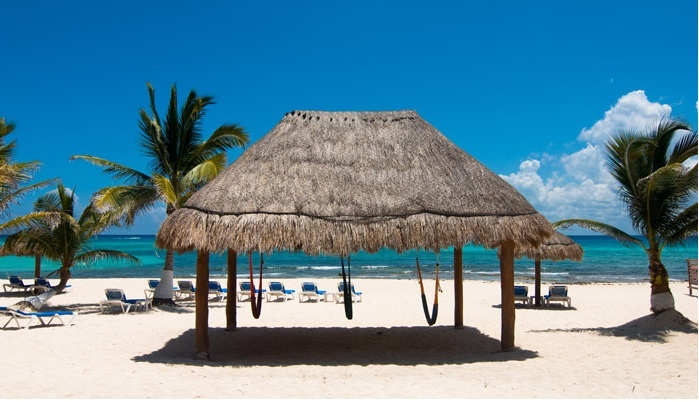 Enjoy the peace and quiet as you gently rock in your beachside hammock. Listen to the sound of the waves while reading a book. 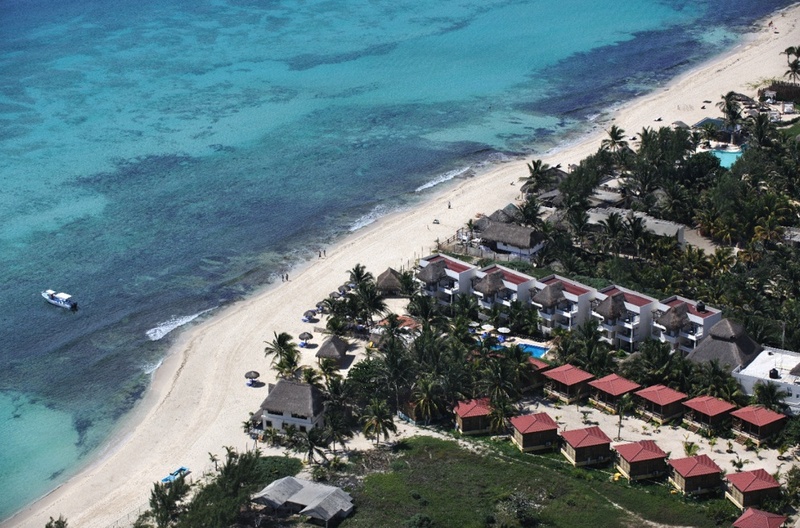 Or if it’s action you’re craving, you can always scuba dive or take a sightseeing tour to the ancient Mayan ruins. 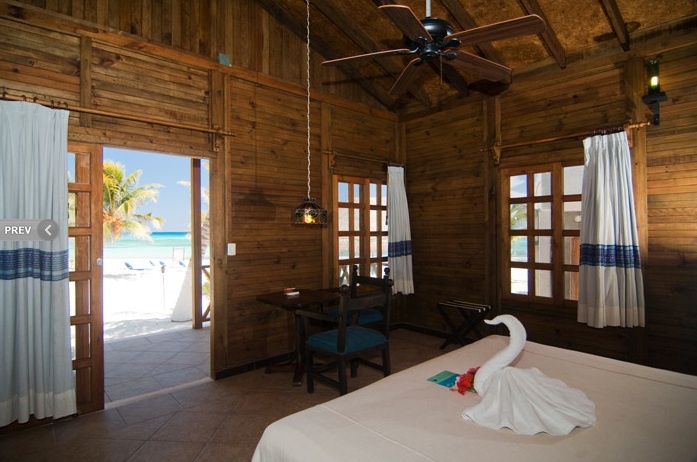 Whatever it is you are seeking, we think you’ll find that Petit Lafitte’s unique combination of relaxation, fun and adventure add up to a truly unforgettable experience. ROOM SECTION: The Room Section is surrounded by gardens and is comprised of five, three-story buildings with six rooms each. 1) Ocean Front Bungalow: The Bungalow Section consists of seventeen individual units located along a beautiful coconut grove and gardens. 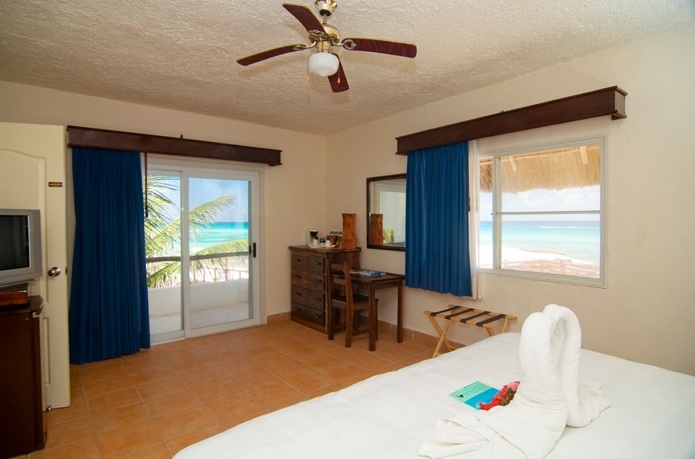 Comfortable – Rustic style unit offering King size bed , A/C, ceiling fan, private terrace, Safe, iron and ironing board, hair dryer, Free WiFi, minibar and coffee maker, direct access to the beach, additional loft with a double bed. Ocean front. Comfortable – Rustic style unit offering King size bed or 2 double beds, A/C, ceiling fan, Terrace, Safe, iron and ironing board, hair dryer, Free WiFi, minibar and coffee maker, direct access to the beach, additional loft with a double bed. Ocean view. Comfortable – Rustic style unit offering King size bed or 2 double beds, A/C, ceiling fan, Terrace, Safe, iron and ironing board, hair dryer, Free WiFi, minibar and coffee maker, direct access to the beach, additional loft with a double bed. Garden View. Convenient style unit offering 1 King size bed, A/C, ceiling fan, Cable TV, Balcony or terrace, Safe, iron and ironing board, hair dryer, Free WiFi, telephone, minibar and coffee maker. Ocean View Premium. Comfortable units offering 1 King size bed or 2 double beds, A/C, ceiling fan, Cable TV, Balcony or terrace, Safe, iron and ironing board, hair dryer, Free WiFi, telephone, minibar and coffee maker. View on the interior garden and pool. When coming from the Cancun airport, you will drive southbound. After 21 km (or about 15 minutes depending on how fast you drive) you will start to approach Puerto Morelos, a picturesque fishing village. Be alert as the road goes from two to four lanes going south. Stay in the central lanes and you will go over a bridge that enables you to drive right past Puerto Morelos as opposed to driving through all of its traffic lights, speed bumps, etc. 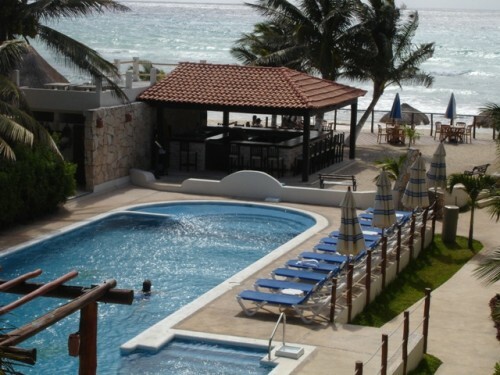 Immediately after the checkpoint, you will see an entrance to the “Tres Ríos” Hotel on your left. About two kilometers later on your left, you will see the entrance to H10 and Secrets Capri resorts. On the right you will see a PEMEX gas station. 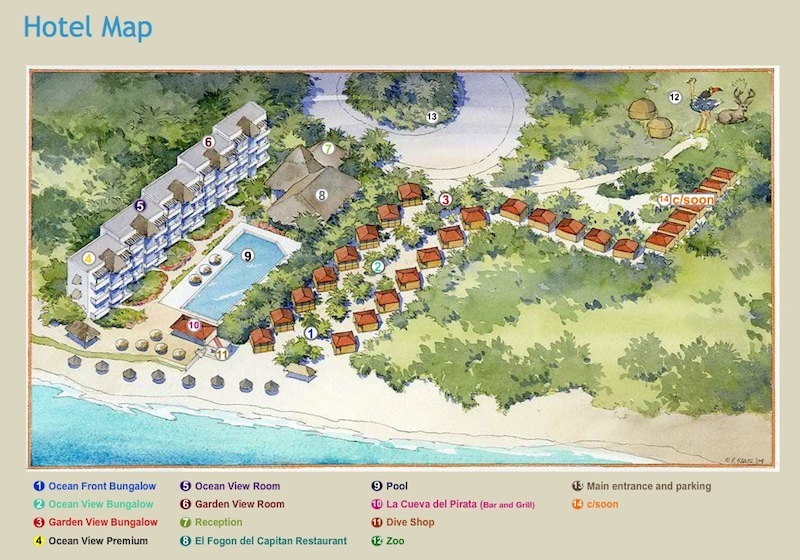 About 1 mile further you will see the entrance to the Maya Koba Resort. At this point, try to stay in the left lane as you are coming within a mile of your left turn. Soon you will see the entrance to the Grand Velas Resort. This is the old site of Capitan Lafitte. At the end of the Grand Velas property, the Princess Hotel begins. Take a left hand turn at the Princess Hotel entrance. You will now be on a nicely paved road. Go straight ahead for one kilometer, (less than a mile). Don’t speed up as there are two sets of speed bumps. Ahead you will see a tall, gray wall that marks the limits of a property. Turn right here as if going to the Princess Hotel. Keep driving and go past the Princess Hotel. You may want to slow down as the paved road soon gives way to a dirt road. Go all the way to the end of this road and you will come to a fence and a sign that reads, “Petit Lafitte 800 Mts” with an arrow that points to the left. Turn left here and drive straight until the end of the road. You will now see a second Petit Lafitte sign indicating a right turn. Take the turn and drive for 150 yards. Drive slowly and you will see a third Lafitte sign indicating a left turn. Take the left. You are just 150 yards away now. Continue straight ahead. If driving at night, you will see torches lining our entrance.